Bushmills 1608 is a limited anniversary edition made with a more richly flavored grain: crystal malt. Rosy amber - coppery - in the glass. It's a much richer color than usually seen in Irish. The nose is rich and sweet with butterscotch, maple, and malted milk with vanilla and sherry lingering. It's yummy. Entry is toffee sweet with a gentle midpalate expansion of sherry, vanilla, cream soda with muted hints of the Bushmills mint. It is a rich and sweet presentation. Peppery around edges of tongue. Finish is gentle and relatively short, arriving with drier notes of herbal bitters, oats, and more oaky vanilla. The herbal quality adds a bitter final note that feels bracing - a balance to the sweetness up front. The herbal final note is recognizably kin to the mint found earlier in the palate in the more commonly met Bushmills & Bushmills black. All in all a richer more complex array of flavors than one usually meets in an Irish whisky. Bravo. If it weren't for Midletons I'd say this rivaled the top of the heap. This is clearly one of Ireland's stand out whiskeys. Highly recommended. Nice review. I agree this is very good whiskey, one of my favourite. Thanks, Luc. I greatly appreciate the response. 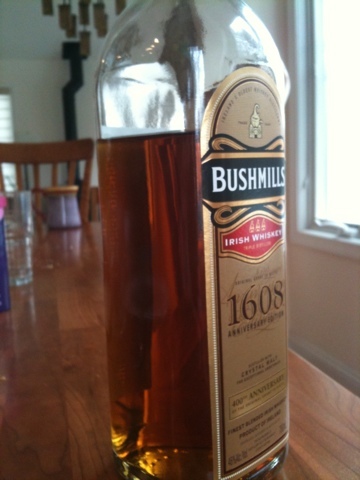 Have you tried Bushmills 16? I haven't tasted it in a long time but recall it was the best Bushmills when I had it. I would be curious to put the 16 against the 1608 head to head and see which was better.